I’m stealing liberally here, from J. Maarten Troost’s Lost on Planet China. I read this book before coming to China and was both fascinated and terrified as a result. His descriptions of the overwhelming population and mind-boggling pollution almost made me whimper with fear. But there were other things he described that I just had to see for myself, like Chairman Mao’s corpse. There was no way not to after Troost’s description. 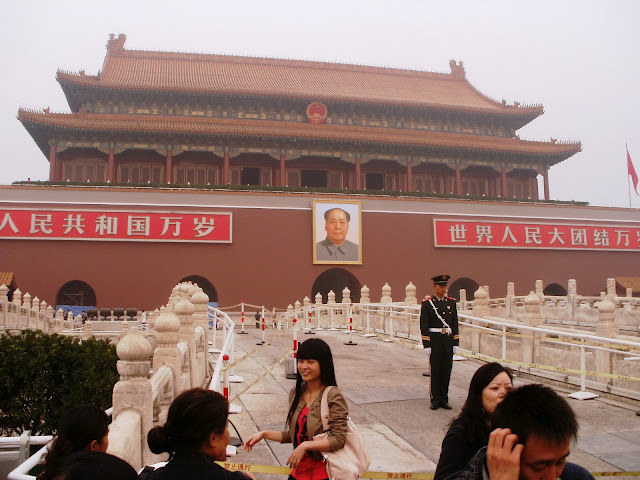 So, I woke up early on a chilly, damp Sunday morning and walked 5km to Tiananmen Square. I was prepared: I did not have a camera, a purse, a bag, nor food, drink, or anything else on me. I did have ID, which was the only requirement. I knew that if I’d had a bag, I would have been pulled out of line to store my bag in lockers across the street. Or I could have given my purse to one of the many people who were guarding and keeping them around the Square. As if! But it’s true — there were people who sat at the sides of the gates all morning while the mausoleum was open from 8am-12pm just to hold bags. I got there shortly before 8:00am because I knew there’d be a line. I’d scouted things out a few days before and had an idea of what to expect. What I hadn’t noticed before is that there were actually two lines; one for individuals and the other for tour groups with guides. Both were very long, and both were entirely Chinese. I drew quite a few stares and am sure I was a curiosity. There I was, a middle-aged Western woman, all alone, soaking wet, shivering in line with thousands of Chinese. I shuffled through the line with everyone else. It took us an hour and the line steadily got longer even as we waited. The guards checked our IDs and then we had to go through security, which was pretty easy since none of us had bags. Then there was a mad dash to buy flowers from the flower-sellers inside the security area. They sold individual white flowers in plastic. Nearly everyone in line bought one. Then we filed inside and they laid their flowers on a pedestal in front of a huge statue of Mao. Most bowed and then got back in line as we shuffled inside to see the body. There he was. Mao. Glowingly orange, just as Troost described. Except it wasn’t Mao that was orange. It was the orange light inside the glass coffin that shone directly down onto his face. It actually gave the illusion that he was lit up from inside. He looked like some sort of nightlight toy. You could see his orange face as soon as you rounded the corner. It was bizarre. We’d been cautioned to be quiet inside the room. I’d seen signs to be quiet in other places as well, but this was the first time that people obeyed. It was like being at a visitation. I felt like we were at the funeral of someone who had just passed away. The atmosphere was solemn. These people were there to honor Mao. We slowly and reverently walked past him and suddenly, it was over. No more than 30 seconds of viewing after an hour of standing in the rain. Then we were outside again, where the lines to see Mao were even longer and people sold Mao medals by the side of the steps. It was a little disconcerting to realize that I’d spent the better part of the morning attending something akin to a funeral visitation when I could have been seeing the sights of Beijing. Still, it was something I had to see for myself. It’s not something I would ever do again, but I’m not sorry I went. It was bizarre, and uniquely Chinese. It is a very odd experience. I went a second time with my husband and daughter. There was still a line. People were still mourning. It’s strange. I wonder if those people have reasons for mourning still. I mean sure, they consider Mao as one of the most important but.. is there a belief or something? like does it bring luck? Gotta visit Beijing again. This is interesting.